TV viewing (live, playback and Broadcaster VOD services) dominates the video viewing of all ages; however 16-24s have a more varied video diet, with TV accounting for two thirds of their total video viewing compared to the UK average of 81%. Whilst it’s great to know how young people are using video, this only tells a small part of the story. We’re bombarded with the word ‘millennials’ – but this is a meaningless term for a diverse bunch. Today’s 20 year old could be in education and living at home with mum or dad or they could be married and working full-time with a kid or two. It’s fair to say that 14-24s are more influenced by age, education and lifestyle than any other group of people – and that this has an inevitable effect on the way they consume video. 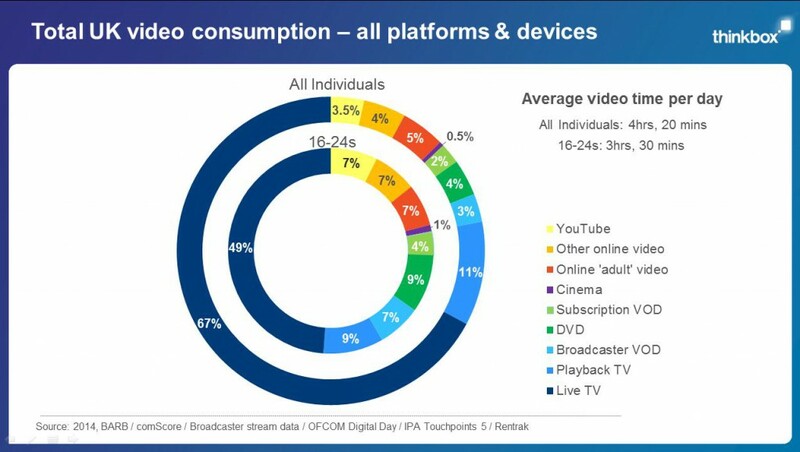 And as we know from the above chart, they consume a lot of video. Are habits shifting for good or are young people doing the things they always have, but in different ways? And how does all of this pan out for advertising? These are the questions that inspired Thinkbox, the marketing body for commercial TV in the UK, to commission market research agency Platypus Research to throw light on the changing video lives of young people. Through a blend of qualitative techniques, including video ethnography, online communities and depth interviews, they discovered the factors that set this group apart and have made AV content an ingrained part of their lives and development.